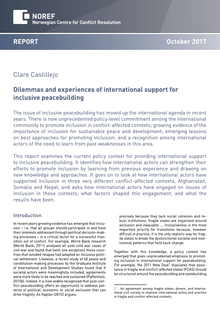 The issue of inclusive peacebuilding has moved up the international agenda in recent years. There is now unprecedented policy-level commitment among the international community to promote inclusion in conflict-affected contexts; growing evidence of the importance of inclusion for sustainable peace and development; emerging lessons on best approaches for promoting inclusion; and a recognition among international actors of the need to learn from past weaknesses in this area. Internationally supported statebuilding processes offer an opportunity to address engrained gender inequalities and develop a state that is accountable to women. However, international statebuilding support has so far been largely gender blind, with the result that such opportunities are often missed. 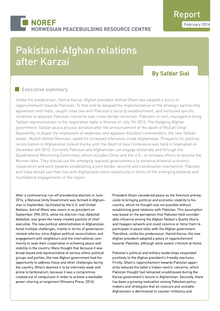 Two different and basically conflicting visions of Afghanistan’s post-transition future were discernible by mid-2012. In one, Afghanistan’s security is anchored in an “enduring partnership” with NATO. Afghanistan's decades of conflict have forced millions of its people - a third of the population - from their homes, their land and their country. Today, many face major problems reintegrating back into society, which are made even worse by escalating conflict and insecurity since the mid-2000s. Two key problems are the lack of access to land and adequate housing, without which many returning refugees and internally displaced people have been forced to live in poor, overcrowded and makeshift conditions.